A piece of art was stolen in broad daylight from an Australian Catholic University exhbition in Melbourne last week. Source: Neos Kosmos. 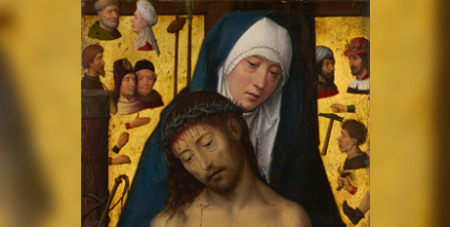 The painting by Melbourne-based artist and iconographer Lisa Ghent was a study made of the famous Hans Memling icon – Man of Sorrows in the Arms of the Virgin – housed at the National Gallery of Victoria. The study took Ms Ghent over 12 months to compete, and was painted in the medium of egg tempera, typical in iconography. Visions of Beauty is the current exhibition that opened on January 14 at the Australian University Art Space in Brunswick Street Fitzroy. It is a collaboration of egg tempera works by some of Australian and Russian Master iconographers and their students. Lisa’s work was stolen on January 17, with police narrowing the time of the incident to be between 1.30 and 3pm. “In the 13 years I have worked in our gallery and studio spaces, we have not suffered a loss of any other artworks,” said Christine Small, visual arts technician at the ACU. Anna Prifti, Director of the Byzantine School of Iconography in Camberwell, where Ms Ghent is a student, was shocked to learn of this while on holiday. “I have seen this work from its beginning to end. Lisa has worked tirelessly and meticulously to complete it. We all hope for its safe return ,” said Ms Prifti. The exhibition will continue until 2 February at ACU Art Space, 26 Brunswick Street Fitzroy.